All of our ad units, explained. Mediavine is proud to offer detailed, daily reporting for all our publishers. 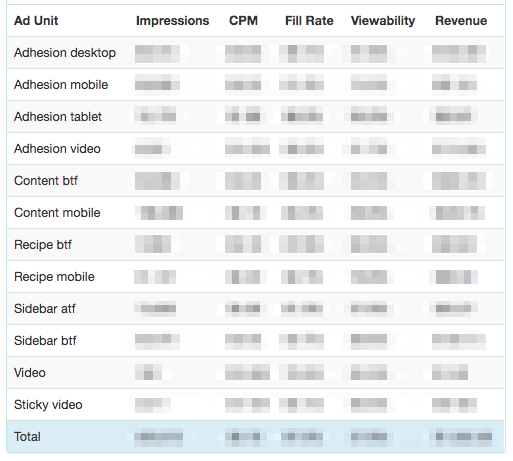 In the Mediavine dashboard, you will find a breakdown of all your ad units and their impressions, CPM, fill rate, viewability and overall revenue. Adhesion desktop: When enabled, the desktop adhesion unit loads in the footer of a browser on desktop. It is a high-performing ad and strongly recommended. Adhesion mobile: When enabled, the mobile adhesion unit loads in the footer of a browser on a mobile device. It is a high-performing ad and strongly recommended. Adhesion tablet: When enabled, the tablet adhesion unit loads in the footer of a browser on a tablet device. It is a high-performing ad and strongly recommended. Adhesion video: This is the beta video adhesion unit, our patent-pending video unit for mobile. Publishers can select a featured video to run in rotation with the mobile adhesion unit. It will only run if a video wins the auction for the mobile adhesion ad. Content BTF: These are the in-content ad units that run inside of your site's content on desktop. Content mobile: These are the in-content ad units that run inside of your site's content on mobile devices. Leaderboard: An optional unit, this horizontal ad known as the leaderboard appears toward the top of sites. Recipe BTF: For sites with recipe content, the recipe card ad appears within the recipe card on desktop. Recipe mobile: For sites with recipe content, the recipe card ad appears within the recipe card on mobile devices. Sidebar ATF: One of our two sidebar units, this is the above-the-fold sidebar ad. It usually appears as one of the first 1-3 items in the sidebar. Sidebar BTF: Also known as our sticky sidebar ad, the below-the-fold sidebar ad lives at the bottom of the sidebar. It "sticks" with a reader as they scroll through your content. Video: This item represents video ads that play pre-roll with the Mediavine video player. If you have uploaded videos to your Mediavine dashboard and embedded them in your site, they will appear here. Sticky video: Our beta sticky desktop player bumps videos to the top of your posts, then allows the ad and video to "stick" with a reader as they scroll down a page of your site.